Check out the Rockin' Party Pit! Blackjack pays 2:1 at select times daily. 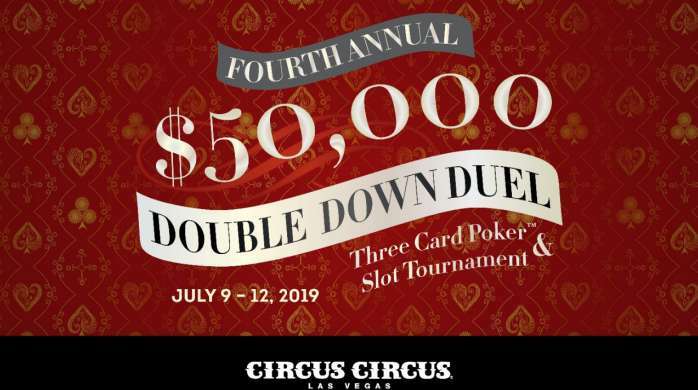 You'll have two ways to win playing both slots and Three Card Poker® in the 4th Annual $50,000 Double Down Duel event. Must have a Circus Players Club card to participate. Full event rules available at the Circus Players Club Desk. Invited guests can contact VIP Services at 800.344.5252 to RSVP for the tournament. Bring a friend to join the tournament for a $75 entry fee, does not include additional room accommodations. Event is also open to non-invited guests for a $75 entry fee. Contact VIP Services for more information. July 9, 1pm - 9pm. Additional Free Casino Play prizes for 2nd - 130th Place. Tournament prize structure is based on a minimum of 200 participants and may be reduced if minimum number of participants is less than 200. Promotional chips have no cash value. Promotional Chip prizes are only valid for use at Circus Circus Las Vegas. Employees of MGM Resorts International, their spouses and family members are not eligible to participate. Circus Circus Las Vegas reserves the right to change, cancel or modify this promotion at its sole discretion without prior notice. Guests must be at least 21 years of age to participate. Circus Circus Las Vegas reserves all rights. MGM Resorts International offers GameSense information to its patrons to encourage responsible gaming at mgmresorts.com/gamesense (in MA at gamesensema.com.) If you or someone you know has a gambling problem or concerns with gambling responsibly, please call the 24-hour Problem Gambler’s Helpline at 1.800.522.4700, or call 1.800.GAMBLER (in New Jersey and Maryland), 1.800.426.1234 (in Massachusetts) or 1.800.270.7117 (in Michigan). Or visit mdgamblinghelp.org (in MD) or masscompulsivegambling.org (in MA) for help. Please play responsibly. If you bet more than you can afford to lose, you’ve got a problem.